Way back when Interesting Thing of the Day was just a gleam in my eye, I started asking people for their ideas on interesting topics I should write about. One of my wife’s friends made the very first suggestion. “You should write about French butter dishes,” she said, “—you know, the kind that keep butter fresh without refrigeration.” I had no idea what she was talking about, but I wrote it down on my list anyway. After unsuccessfully trying to locate one of these things in France, I did a few web searches and sure enough, French butter dishes—like the one now in my kitchen—are quite interesting. The idea behind French butter dishes is pure, ingenious simplicity. Butter at room temperature quickly turns rancid when exposed to oxygen, so the usual means of preserving it is to store it in the refrigerator. But all that’s really needed is to keep air away from the butter. A French butter dish does this by using water to form a seal between the butter and the air. There are two parts to the dish: a smaller, bell- or cone-shaped piece that sits on a wide base, and a second, larger container. You fill the bell up with butter, put water in the larger container, and invert the bell into the water. Because butter is basically an oil, it won’t mix with the water, and as long as it’s not too hot, it will remain sticky enough to stay inside the bell. You can keep this on your kitchen table so that butter is always available without the need to soften it. Of course, most people have refrigerators, so keeping butter fresh is no longer much of an issue. But for some unfathomable reason, even in the technologically advanced and culturally sophisticated 21st century, I regularly find myself at restaurants that serve hard, cold butter with their soft, warm bread. Presumably the temperature of the butter is supposed to reassure diners that it’s fresh, but I am utterly at a loss to comprehend what technique I am expected to employ to spread the butter while keeping both the bread and my dignity intact. This is, for me, one of life’s great imponderables. But it’s a problem solved neatly and painlessly by a French butter dish—always fresh, always soft, no refrigeration required. Every restaurant should use them. I should point out that for all their virtues, French butter dishes are not maintenance-free. The water needs to be changed every two or three days, and some people recommend adding salt to the water to retard the development of mold. They’re also not impervious to heat. If you leave a full dish in a hot room or in direct sunlight, the butter can melt and ooze into the water when you lift the lid—not a pretty sight. It’s also important to top off the butter regularly. 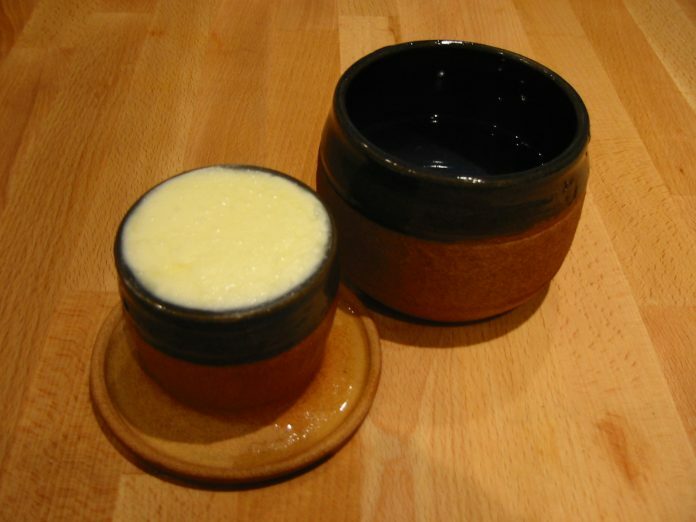 If the bell is only half full, a layer of air will be trapped between the water and the butter, defeating the purpose of the dish. Some designs overcome this problem by placing small holes in the sides of the bell to allow the air to escape. There’s yet one other problem: what exactly one should call them. I call them “French butter dishes” because that seems to be the most popular name, but it’s a bit of a misnomer. If you go to any random housewares shop in France and ask for a butter dish, or beurrier as they’re called there, you’ll get an ordinary, everyday butter dish that will hold a stick of butter quite nicely in your refrigerator—not one of these. (According to the scant evidence I’ve been able to piece together, the design apparently originated in the French town of Vallauris, but is now more popular in the United States than in France. Go figure.) In any case, this particular type of French butter dish goes by quite a few names. I’ve seen them called Butter Bells—a term that is trademarked by L. Tremain, Inc.—as well as French butter crocks and butter keepers, among other things. But none of these terms quite does justice to the unique design. Perhaps the pottery makers of the world would consider the term cloche de beurre, which is French for “butter bell” and not, as far as I know, trademarked. If the name catches on, remember: you heard it here first. As it turned out, over the past 15 years, French manufacturers of butter dishes have largely settled on the term cloche à beurre—which, if my French skills in 2003 had been a bit more advanced, would have been the obvious answer—but I have nevertheless found no fewer than 16,000 references on the web to “cloche de beurre,” which is still defensible, if inelegant. In any case: well done, everybody! French butter dishes are cool because they’re a low-tech solution to not just one, but two annoying challenges—keeping butter fresh and keeping it soft. Just thinking about them makes me hungry for a baguette. There are umpteen (by actual count) manufacturers of French butter dishes on the web, with tremendously varying designs, materials, and colors. Amazon.com carries quite a few different designs. I bought mine from Lee Daniels Clay in Brinnon, Washington. I was favorably impressed by the quality of workmanship, the rapid and secure shipping, and the customer service; I’d recommend them to anyone. Note: This is an updated version of an article that originally appeared on Interesting Thing of the Day on July 5, 2003, and again in a slightly revised form on June 14, 2004.